Smok Alien 220W Box Mod Deal – ONLY $29.95!!! One of the hottest devices of 2016, the Smok Alien 220W Box Mod certainly isn’t new, but with its enormous popularity in the past we thought that we should share this deal. 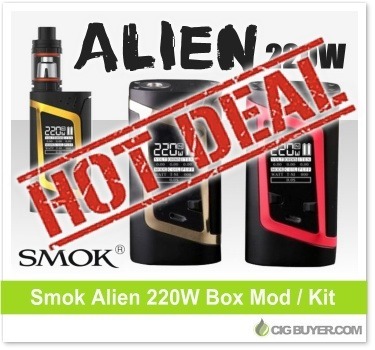 For a limited-time, VapeDeal.com has the Smok Alien Mod available for only $29.95 ($39.95 kit)! The Alien 220W Box Mod is powered by dual 18650 batteries and boasts a huge amount of power with full temperature control (Ni/Ti/SS). It has a unique, full-length side firing bar with a large OLED screen and discreet adjustment buttons on the face. Available in a variety of color combos, it’s still a great looking device with most of the bells and whistles.